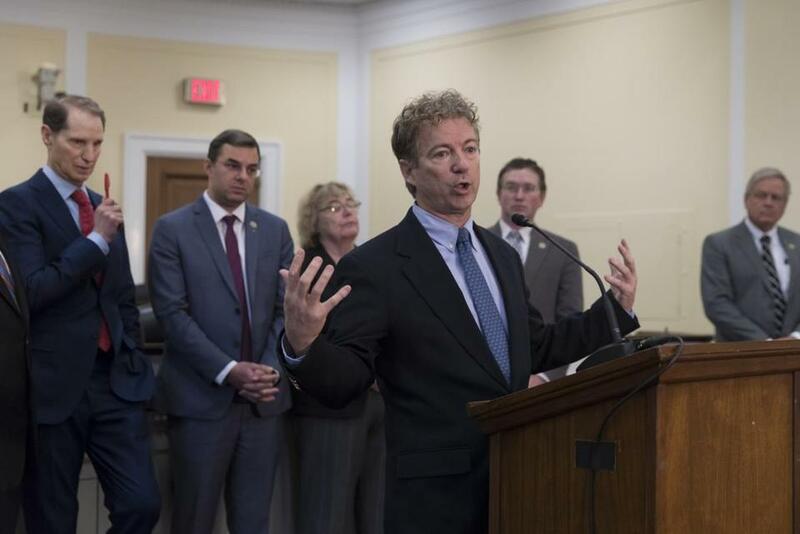 Senator Rand Paul answered questions for reporters Thursday. WASHINGTON — A proposal to impose significant new privacy limits on the National Security Agency’s warrantless surveillance program failed in a House vote Thursday, despite a yearslong effort by a bipartisan group of lawmakers to bolster civil liberties protections. Lawmakers are now taking up a bill that would extend the legal basis for that program for six years with only minor changes. But as a prelude to final action, the House of Representatives voted 233-183 to defeat an amendment that would have limited its extension to four years and added a series of privacy protections. The vote was a significant defeat for civil liberties advocates in the debate that broke out in 2013, following leaks by intelligence contractor Edward Snowden. The issue centered on a law called Section 702 of the FISA Amendments Act. FISA stands for the Foreign Intelligence Surveillance Act, which Congress modified after 2008 to legalize warrantless surveillance of foreigners abroad even if they are talking to Americans. President Trump suggested a key program to collect foreign intelligence could have been used to “badly surveil and abuse” his campaign, but later expressed support for it. Among other changes, the proposed amendment would have required officials to obtain court warrants before hunting for, and reading, private emails and other messages of Americans that are swept up by the program that targets foreigners’ communications in counterterror and espionage cases. The bipartisan coalition backing overhaul efforts — which includes some of the most conservative and most liberal members of the House — argued that change was necessary to uphold the meaning and substance of Fourth Amendment privacy rights in light of 21st-century communications technology and surveillance powers. But the intelligence community and Trump administration balked at that proposal, saying it would impede their efforts to protect the country to require warrants to query information the government already possesses. House leaders also opposed the amendment. Trump’s first tweet on the topic Thursday appeared to encourage lawmakers to support limiting the law. The White House press secretary, late on Wednesday, issued a statement asking that lawmakers vote against it. “’House votes on controversial FISA ACT today.’ This is the act that may have been used, with the help of the discredited and phony Dossier, to so badly surveil and abuse the Trump Campaign by the previous administration and others?” he wrote. 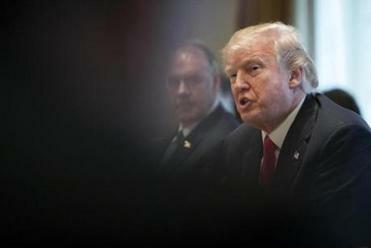 In his Twitter post, Trump was referring to an explosive and largely uncorroborated dossier that details claims about ties between Russia and Trump and his aides. The tweet enraged Republican leaders on Capitol Hill who have been trying to chart a course to renew it, more or less intact, and left leaders in both parties scrambling to secure votes. Speaker Paul Ryan, R-Wis., and Trump spoke by phone between the president’s two tweets, according to a senior Republican congressional aide. Rep. Nancy Pelosi, D-Calif., the House Democratic leader, asked Ryan to pull the bill from consideration, according to a senior Democratic aide familiar with the request. But Republicans, battling a last-minute push from conservative lawmakers, gambled on moving forward with a vote. Republican leaders in both the House and the Senate have been counting on enough moderate Democrats and Republicans to stick together to extend the legal basis for the surveillance program with only minimal changes. The debate centered on an expiring law, Section 702 of the FISA Amendments Reauthorization Act, which permits the government to collect without a warrant from U.S. firms, like Google and AT&T, the emails and other communications of foreigners abroad — even when they are talking to Americans. Trump, who is known to watch Fox News while he is tweeting, posted his tweet that appeared to support limitations to the surveillance law, shortly after a Fox News legal analyst appealed directly to the president during a Thursday morning segment about the upcoming House vote. The analyst, Andrew Napolitano, turned to television cameras and said, “Mr. President, this is not the way to go.” He added that Trump’s “woes” began with surveillance. By midmorning, in a follow-up tweet, the president appeared to step back from supporting the limits that his own administration has been encouraging lawmakers to reject. “With that being said, I have personally directed the fix to the unmasking process since taking office and today’s vote is about foreign surveillance of foreign bad guys on foreign land. We need it! Get smart!” he wrote.